What is the "E-Patient" movement and how might it converge today with the mental health community? That is the question we asked in the opener to this series. 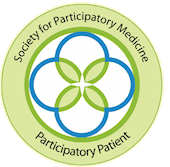 This second installment is a snapshot of recent topics in the E-Patient communty, through the eyes of yours truly, a year-long member of The Society for Participatory Medicine (aka @s4pm on Twitter). Despite the "E" in the term, being an E-Patient (as @s4pm uses that term) is not only about using online information for offline health. As shown in the button above, the "E" also stands for equipped, enabled, engaged, and empowered. To this foursome, many observers add "electronic" since so many of us do connect via web sites and social media. The group began to increase engagement by all patients in their own health and to increase a sense of partnernship between a team of equals as patients and health professionals learn to work more collaboratively. So what might we see with more e-patient participation in mental health? To me, it boils down to what each individual seeks to feel more aware and better equipped. What can you imagine wanting to learn and see with more patient engagement in mental health? More information about drugs and therapies? Fuller comparisons of different approaches and outcomes? More statistics? More about new perspectives in neuroscience and psychobiology? Added repartee in places like Twitter, PsychCentral and all the blogs and forums about specific conditions? More insurance coverage or better parity? Greater online access to especially skilled therapists? More clues about the genomics of mental conditions and who may be most at risk? Or perhaps all the above and then some? Do you hope to see patients form a movement in which the value of 'patient empowerment' becomes much more obvious? If yes, one place to start is here (via good friend and patient evangelist, E-patientDave) is this inspiring slide deck by Tom Ferguson MD, founder of SPM (sample in screenshot above). Or for a more recent update, try a free download of the Society's E-Patient White Paper: e-Patients: How They Can Help Us Heal Healthcare. Waiting for more price transparency? Try this link (again from E-Patient Dave): “Visible” is not “transparent.” Let us see prices. Do all the emerging innovations in health-tech fascinate you? From the quest for a diagnosing "TriCorder" to tissue-embedded sensors to data-driven patient communities, you may wish to start with this predictive overview at Fastco.exist (screenshot at left). Or perhaps you hope to see more crowd-sourcing of worthy healthcare projects and startups? Explore Medstartr for one such site that crowdsources funding today. Or do you perhaps hope to see patients crowd-source their own studies and stats? 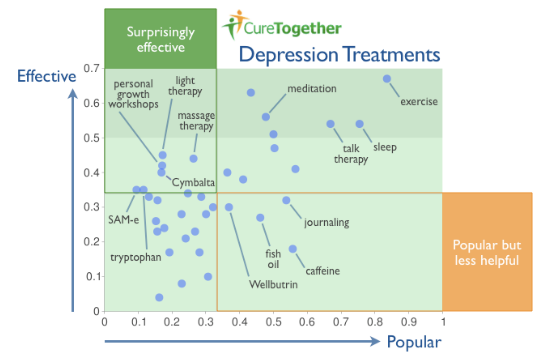 Sites such as CureTogether.com (in the screenshot left) are already using the 'wisdom of crowds' to compile statistics in mental health and other arenas. You can also visit Genomera.com to see emerging efforts to crowd-source research funding for new health discoveries. 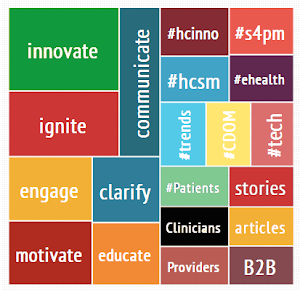 Are you fascinated by the intersection of social media and health? Consider this FastCompany piece (The Future of Health is Social) and then consider the health #hashtags project at Symplur if you also spend time on Twitter. Or to compress all those worth-remembering tweets into a nicely formatted feed, consider a tool such as paper.li (sample: "EPatient Daily" by Glenn Marshall). The bottom line to me at this moment in time? Whatever your interests -- from treatment specifics to social change or systems issues -- any time that you spend increasing your own health engagement is an investment that will pay back with compounding interest.